We started our dinner at Empress with the Crispy Aromatic Duck Salad ($18). A salad menu? This is something new for a Chinese restaurant. 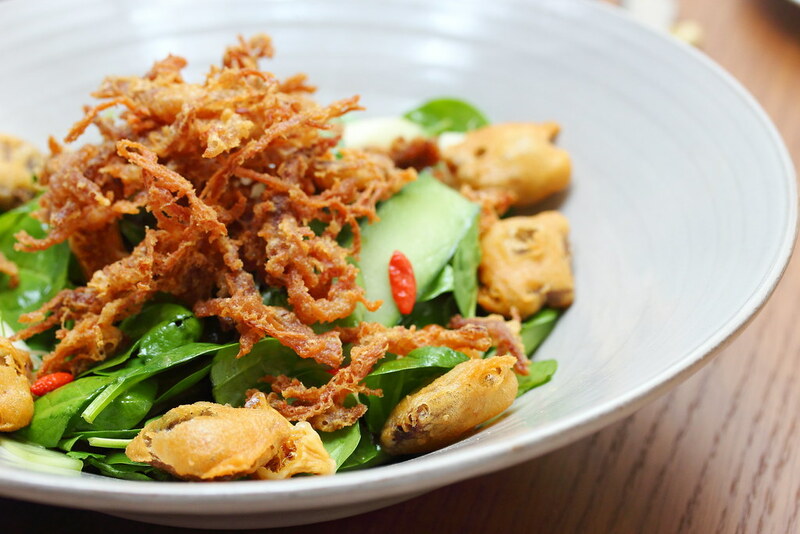 The bowl of greens come with baby spinach, micro herbs, Asian pomelo, nashi pears, goji berries, cucumbers, spring onions, chinese figs. The medley of ingredients are perfectly hold together with the plum citrus dressing, giving it a sweet tangy finishing on top of the different play of textures. The Triple Roast Platter ($28/$42/$56) comes with Empress Char Siew, Crackling Roast Pork, Empress Sticky & Sweet Pork Ribs. 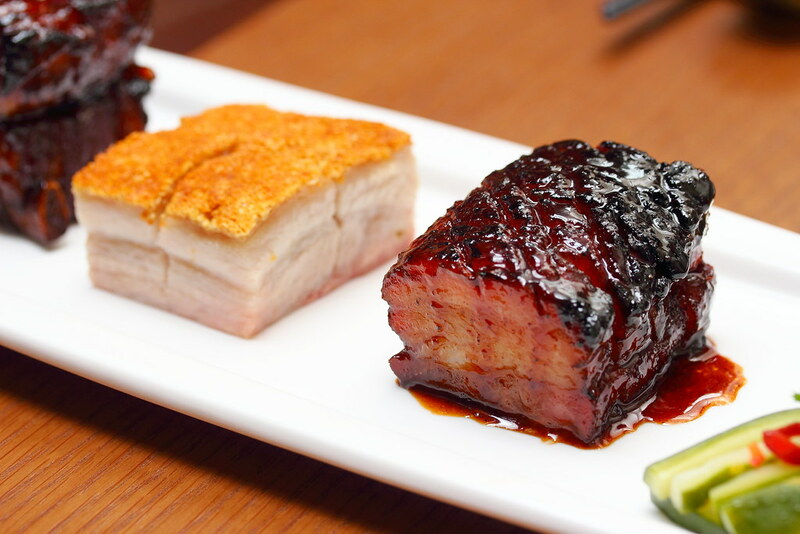 The glittering char siew using pork belly lacked the roasted firmness and aromatic char. The sticky and sweet pork ribs has a firmer bite to it and works better with the sweet sauce. Lastly the must try is the crackling roast pork or sio bak. it has a biscuity skin that reminded me of my favourite sio bak stall from Cross Way Bay Hong Kong Roasted Meat. 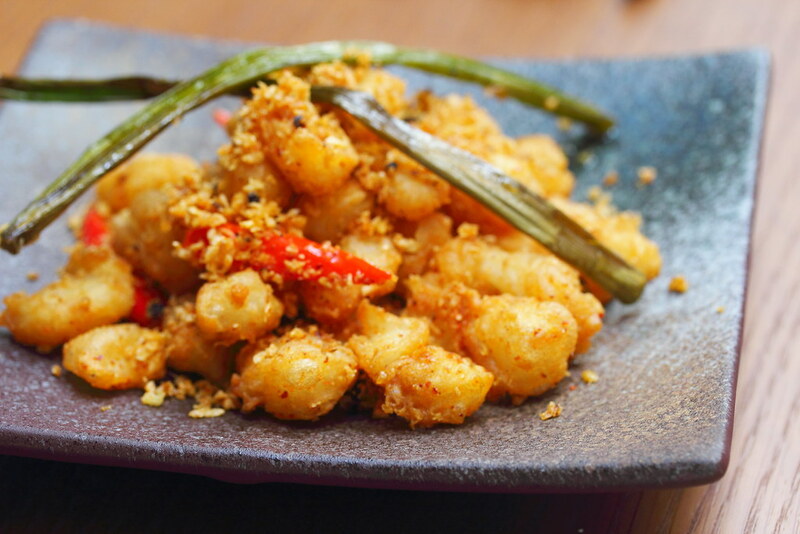 An addictive appetiser is the Crispy Cod Bi Feng Tang Style ($12/$18/$24) with caramelised shallots and chilli. Could not really taste the cod but the crispiness coupled with the salt and pepper seasoning is very enjoyable. Unknowingly we were fighting for the last few pieces. 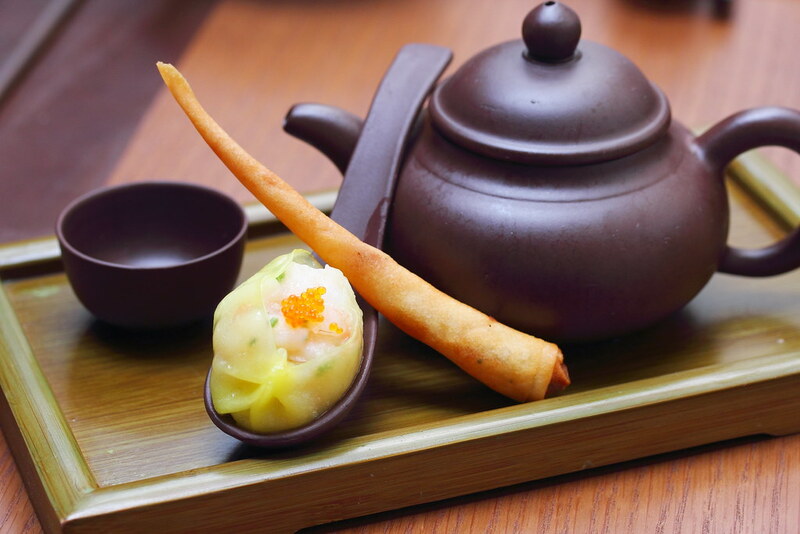 For the soup, we tried both the King Prawn Dumpling in Supreme Broth ($14/pax) and Teapot Soup ($14/pax). Both soup bases are rich, comforting and flavoursome. I could not decide which is my favourite as they are both delicious. End of the day, I guess it really depends on the mood. Whether you prefer something more sumptuous or delicate. At Empress, they have up the game with adding lobster to the mapo tofu. 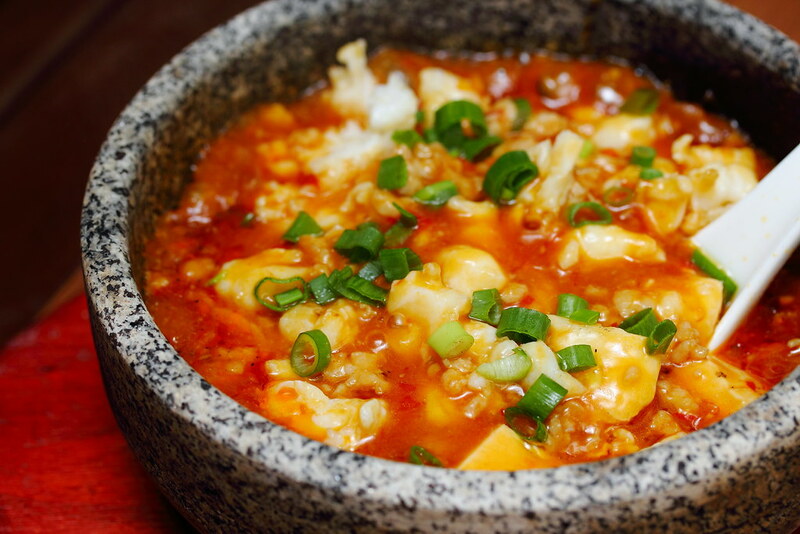 The Lobster Mapo Tofu ($28/$42/$56) comes the silky smooth tofu with bouncy chunks of lobster meat. I felt that the spicy level was rather toned down. I was hoping for a more fiery kick to it. 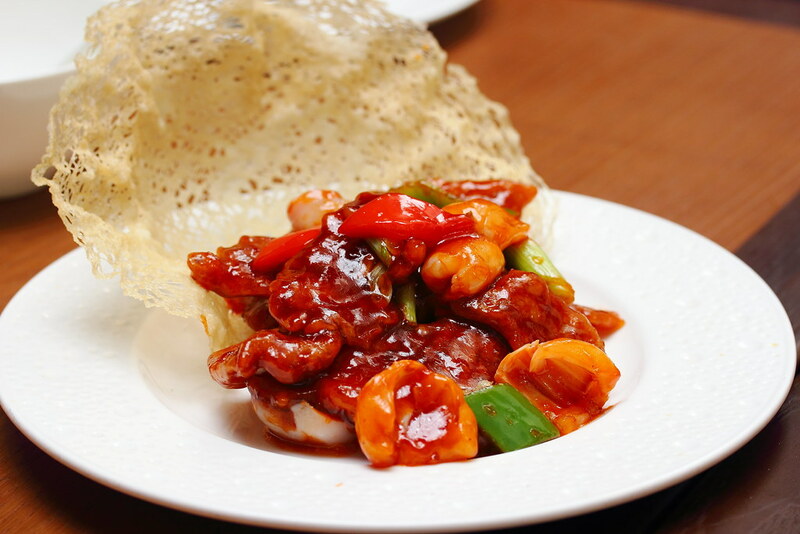 I like the version of Sweet & Sour Pork ($24/$36/$48) at Empress. Instead of the usual pork cubes with a thick layer of batter, the version here is cut into pork slices with a very thin layer of batter. Probably my own preference but the pork slice's texture is more enjoyable. 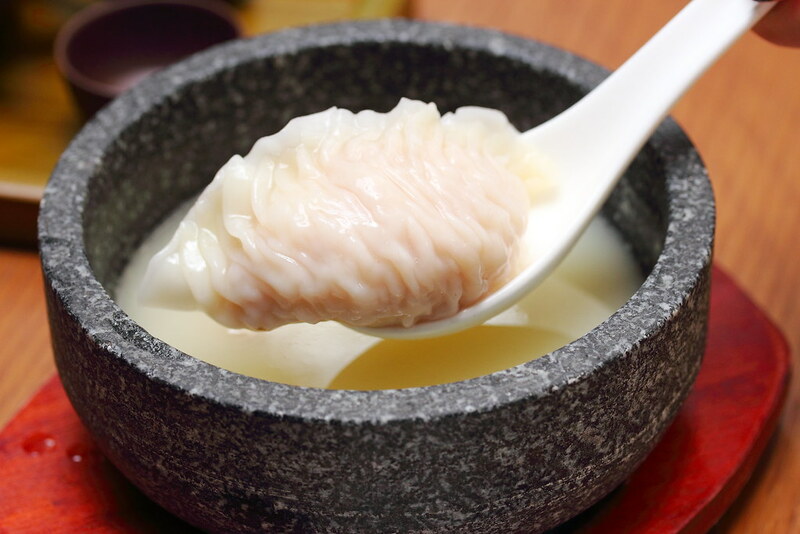 Aged vinegar is also used to bring out the sourness, with the lychee lending a sweet fruity finish. With such a majestic name, Dragon's Breath Angus Beef Hor Fun ($22/$33/$44), I was having a high expectation for the dish. Unfortunately, I think the dragon was out of breath during my visit. 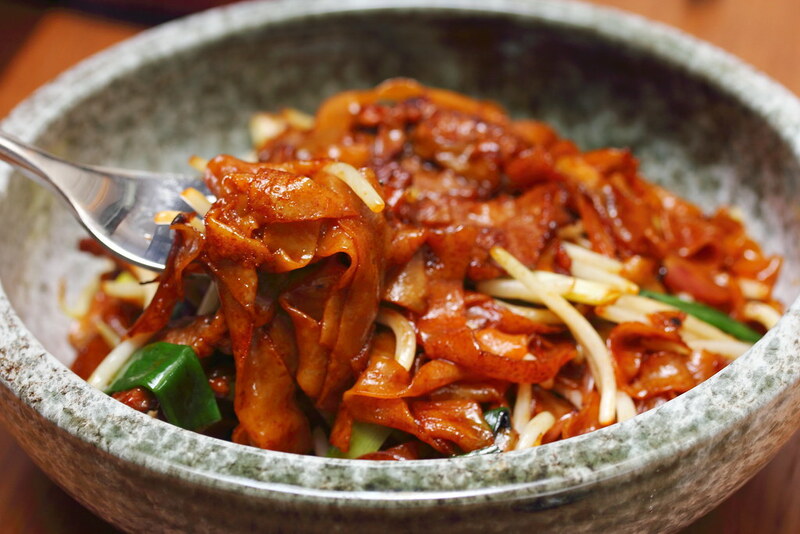 Besides the tender slices of Angus beef, the bowl of dry fried rice noodles fell short of my expectation with the saltiness of the sauce throwing the balance off. The main surprise I get from Empress is actually their dessert. Never would I expect a Western trained pastry chef to work alongside a Chinese chef in the kitchen, creating western dessert with Chinese elements. 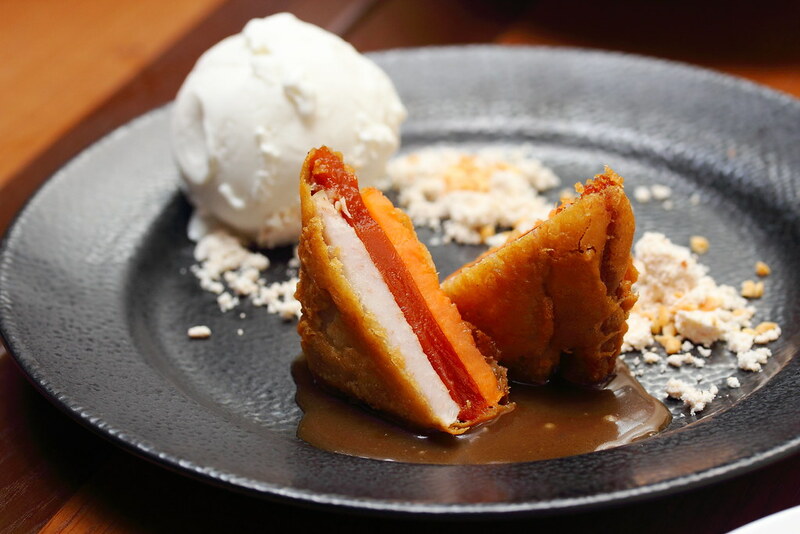 A popular Chinese New Year dessert, the Crispy Prosperity Nian Gao, Yam & Sweet Potato Stack ($12/pax) has made it to the menu permanently. 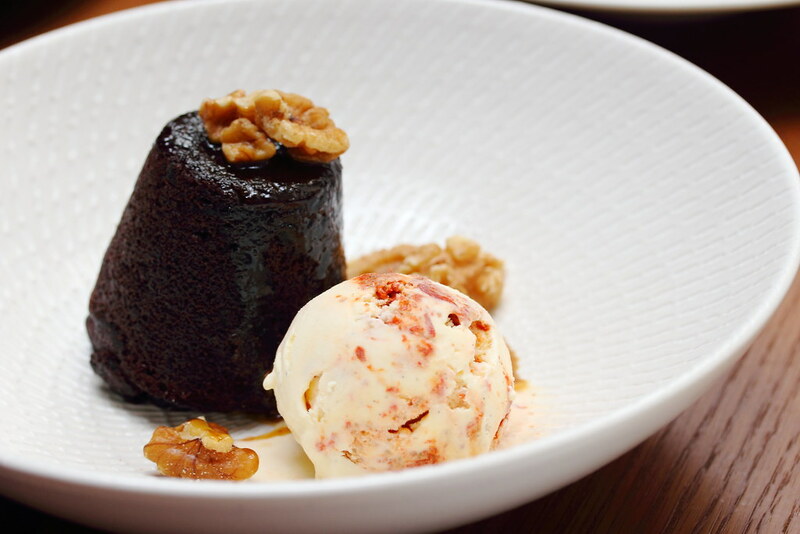 It is accompanied with salted peanut, toffee, coconut ice cream to complement the East meets West creation. Looked rather ordinary is the Sticky Date & Longan Pudding ($12/pax) with gula melaka butterscotch, walnuts, goji berry & vanilla swirl ice cream. Although the date pudding is cakey instead of being sticky and moist, what surprises me is the pieces of dried longan inside the pudding. I never expect the combination to work, but it did. The last time I had Cempedak Creme Brulee ($13/pax) was at Orchard Cafe, Orchard Hotel. But not many restaurants do it as cempedak can be quite strong and acquire in taste. I personally likes cempedak and hence I was delighted to have the dessert on the menu. 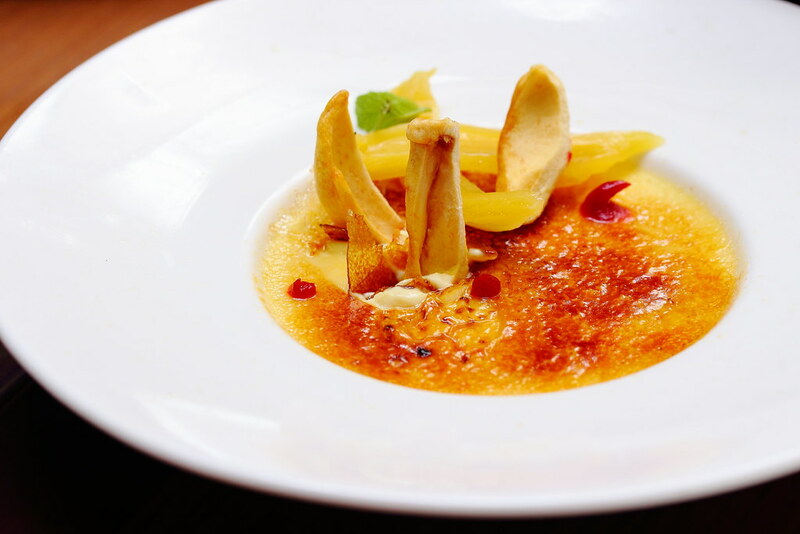 The pastry chef does a good job in the creme brulee, bringing out the flavour of the acquire fruit yet not throwing the balance of the dessert off. 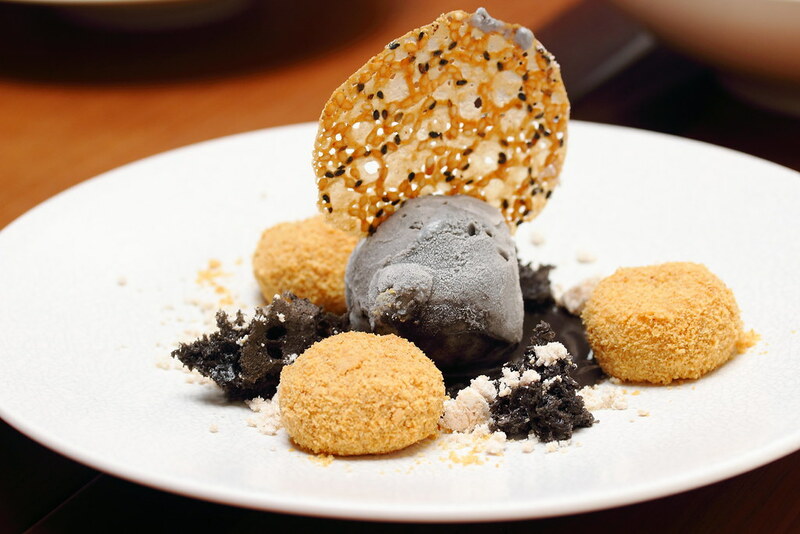 I enjoyed the soft and chewy texture of the Peanut Coasted Black Sesame Mochi Balls ($12/pax). However as a dish, I thought it lacked a bit on contrast, with a singular flavour of sesame. 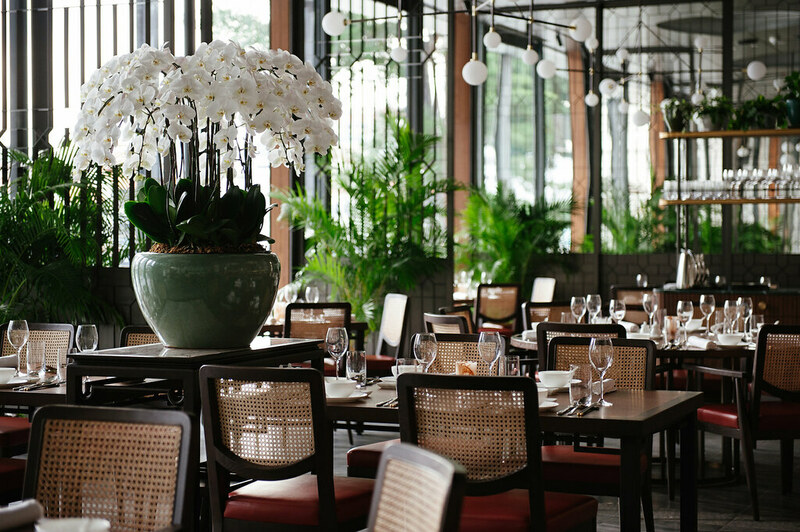 If you are looking for a Chinese restaurant with a great ambience and view, Empress will be a good venue. I would recommend trying the crispy duck salad, soup, roasted pork and sweet & sour pork. Do also save a bit of space to try some of the unique dessert creation.